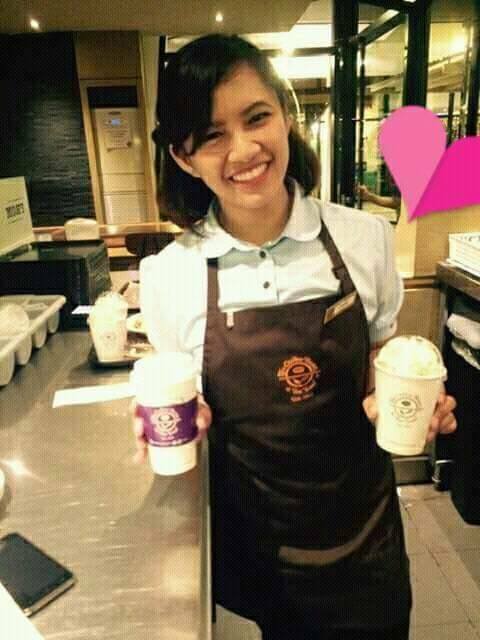 Anihan Technical School graduate, Mary Ahmielitz Hinguillo is a Store Manager of Coffee Bean and Tea Leaf located in Nuvali, Sta Rosa. Ahmielitz served beverage for guests. Mary Ahmielitz R. Hinguillo is the younger sister of another Anihan graduate, Maria Carmina, who is now working and living with her family in Canada. Their father stopped working due to a motor accident while their mother works as a barangay health worker in their area at Sta. Rosa, Laguna. They are four siblings, two girls and two boys. Unfortunately, one of her brothers passed away when he was only twelve years old due to brittle bone disease. Ahmielitz chose to study in Anihan not only because of the skills but also because of the values that they teach. She valued the technical knowledge and the classes that give human formation. She appreciated the mentoring sessions she had with her personal mentor and until now, she keeps in touch and gets to talk to her in her venue. She would apply the values that she learned in Anihan in her present job. Needless to say, it has helped a lot that in two years’ time, she is now a store manager. Ahmielitz did her On-the-Job-Training in The Palms Country Club in Filinvest, Alabang. They gave her a very good exposure in food service. She was assigned at the back of the house. Having that as foundation of her present work, it was a big help to be managing the store because she knows what is going on in both front and back of the house.